A Republican Georgia state senator running for governor announced the start of his “Deportation Bus Tour” on Tuesday, which he said will consist of rounding up illegal immigrants in a school bus labeled “Murderers, rapists, kidnappers, child molestors, and other criminals on board.” It misspells molesters. 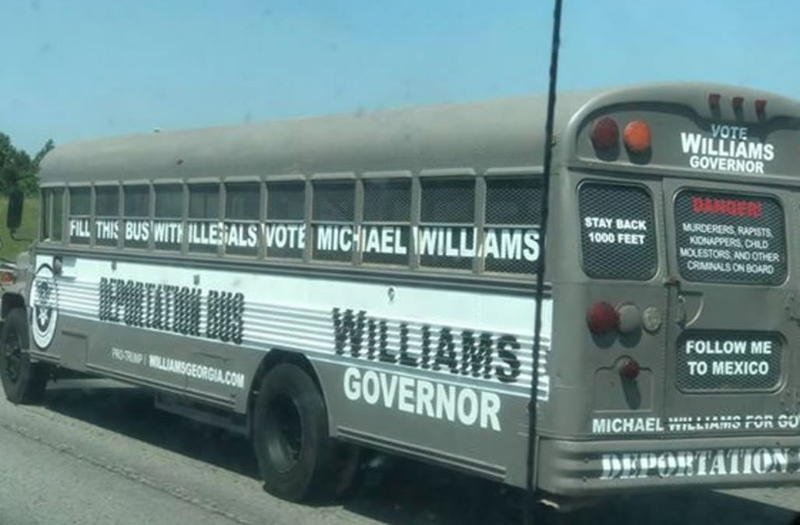 Michael Williams, who was his state’s co-chair for President Donald Trump’s presidential campaign, said the tour aims to “shine a light on the dangers of sanctuary cities and the overwhelming problem of illegal immigration.” The bus will make stops in Clarkston, Decatur and Athens, the state’s three sanctuary cities. Sanctuary cities generally limit police compliance with federal immigration authorities. “We’re not just going to track them and watch them roam around our state, we’re going to put them on this bus and send them home,” Williams said in a video promoting the bus trip. It’s unclear how the politician plans to lawfully apprehend immigrants, let alone deport them. Williams did not respond to a request for comment. Williams touted his role in some of the country’s toughest immigration laws, including one that requires local law enforcement to notify Immigration and Customs Enforcement if they have an undocumented immigrant in custody. Williams’ attack on sanctuary cities echoes the Trump administration’s shots at them as part of its immigration crackdown. The Department of Justice sued the state of California in March for policies meant to help local law enforcement work with immigrant communities.